How many of us enjoy being angry? No one, in fact, does. Anger is one of the most wasteful emotions. It makes you lose your equilibrium and leaves you hurt, bruised, injured and grumpy. Yet we all succumb to anger almost all the time. 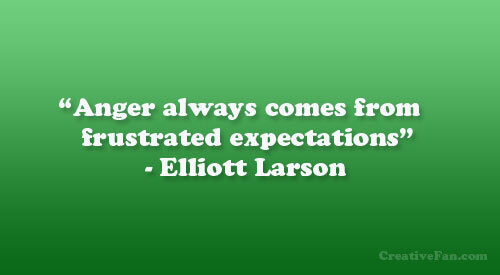 Clearly, anger is our quickest, easiest reaction to an expectation not being fulfilled. To deal with anger, understand its anatomy carefully. Go to its root. If you work on the periphery, at the symptoms, you will not be able to get over anger. By getting angry with someone or something, you are only transferring the energy released by your anger to someone else. Then that someone releases it on someone else. And so the ruinous chain continues. So, go beyond the periphery if you want to halt this chain reaction. You have to go to the cause of what’s making you angry with people and situations. When you go down to the cause, you will find that despite the contexts being different, all causes boil down to being the same __ you got angry with someone or something because what you expected was not done, delivered or did not happen. So, whether it was coffee being served cold at a restaurant or the long queues at security at the airport or a distasteful meeting at work or a showdown with your companion at home, at the bottom of all of these is the common thread of your expectations remaining unfulfilled. And this cause is what makes you angry in a myriad situations. So learn get to the cause, the bottom, of your anger. Expunge all expectations from your Life. Understand this well. Wishing is not wrong. But the expectation that your wish will be fulfilled, simply because you wished it, is what is ruinous. Some of our wishes in Life will still remain unfulfilled when we die. Accept this reality. Then when the coffee arrives cold, your mind does not rush to think of a conspiracy by the restaurant. Or being in a long queue becomes an opportunity to drop anchor and meditate than to crib and lament. A distasteful meeting then becomes an opportunity to decide not to attend such timewasters in the future. And the showdown at home will never be because you will be more compassionate than complicated! Don’t try to avoid anger though. That will be equally disastrous. Because anger is, interestingly, a natural response to and in Life. It is also an incredible amount of energy released and available for productive use. Avoiding it therefore will not help. Channelizing it well will instead result in bringing out lasting changes that make the world a better place__that’s what Gandhi did with his anger at being thrown out of that first class compartment in Pietermaritzburg in South Africa in June, 1893. At a deeply personal and everyday level, getting to anger’s root though, and weeding out the expectations that cause anger, is what will help us live more peacefully despite the people and circumstances in our lives. If we can use some of that energy available to make this world a better place, great. But even if we manage to make ourselves better, a wee bit, every single day, won’t the world already be a lot better than it is?